Meet ex-SAS soldier and whistleblower Ben Griffin and ex-prisoner of the US and anti-war activist Ciaron O’Reilly. Interactive exhibition about Bradley Manning. When: 1.30 – 4.30pm, Friday 13 April. Free entry. All welcome. Refreshments available. 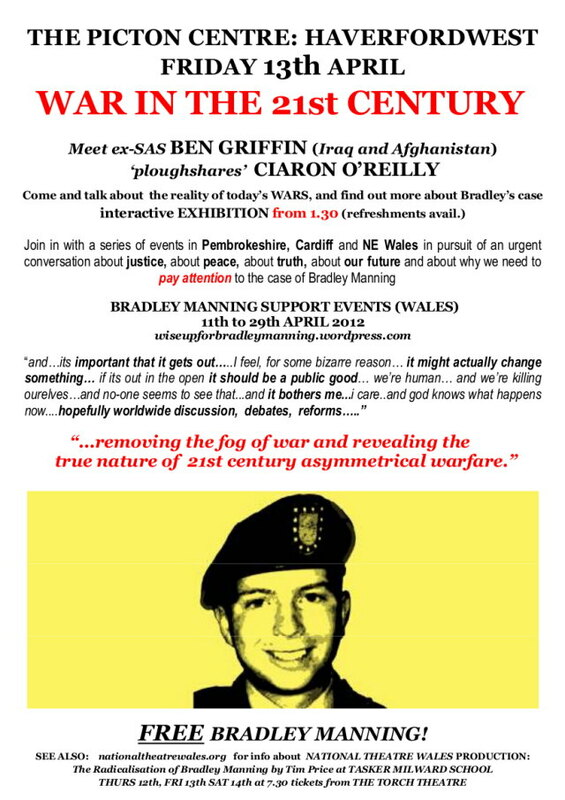 This entry was posted in Announcements, Manning and tagged anti-militarism, anti-war, Ben Griffin, Bradley Manning, Ciaron O'Reilly, exhibition, Haverfordwest, Pembrokeshire, Wales. Bookmark the permalink.